In a small pot, combine all ingredients except kombu seaweed and over medium heat, bring mixture to boil. When sugar has dissolved and mixture reaches a slight boil, remove from heat. Transfer to a bowl, add the kombu to infuse and allow to cool. When sushi vinegar has reached room temperature, transfer to container and keep in refrigerator until ready to use. Strain the kombu prior to using the sushi vinegar. Note: All the Japanese ingredients listed can be found in Japanese stores and Asian markets. Wash the rice under cold running water thoroughly and strain to remove excess water. In a rice cooker combine rice and water, cook using white rice or "sushi" setting. Prep Notes: While the rice is cooking, usually between 40-50 minutes, you can prep the sushi roll filing. When the sushi rice is cooked, immediately transfer to a medium flat bottom container. Begin to pour 1/4 cup of strained sushi vinegar over the rice while mixing the vinegar and rice together. The liquid will absorb into the rice. It's best to work quickly in mixing. You want to break down any large lumps and coat the rice very well. Do not overwork the rice as it will become sticky. When rice has cooled down, place a moistened towel over the rice. Keep covered until ready to assemble the sushi rolls. You can substitute with other vegetables, tofu or prepared seafood as desired. Important: Check fish or shellfish for freshness. Note on Sushi rolling: To feel comfortable rolling, practice a few times, best to make a bit extra preparation and try rolling until the desired result is achieved. Once the roll is made it will be difficult to roll it again. Do not force the roll to close as the nori will tear. Lay out a small Roul'Pat on kitchen work surface. Place a sheet of the sushi seaweed on top of the mat. Note: Make sure the seaweed is parallel to the mat for even rolling. 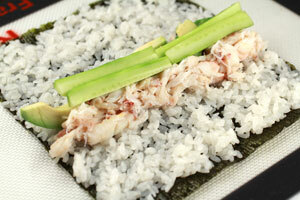 Add a generous handful of the sushi rice and spread from the top side of the nori seaweed to bottom. 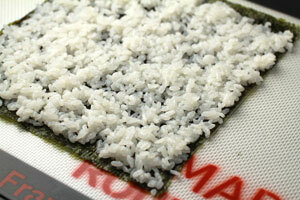 Note: Do not add too much rice to nori sheet, it will be difficult to close the roll. There should be no more than 3/16 inch of rice on the surface of the nori seaweed. Add the prepared filling ingredients to the center of the roll and keep them bundled together with both hands on the bottom side of the Roul'Pat roll from the top edge and cover the filling. Crimp the top edge of the nori to the underside of the filling to keep the roll tight. Proceed to roll the sushi roll to complete. 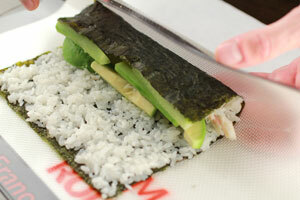 Note: Spread the rice leaving a 1/4 inch space at the bottom of the nori seaweed, this will help close the roll. Transfer the sushi roll to a cutting board and with a sharp knife cut the roll in half and cut even pieces. Serve with soy sauce and wasabi (Japanese horseradish) and pickled ginger (gari). 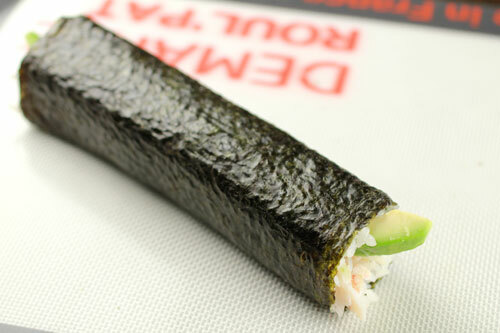 Note: This recipe is calculated for 3-4 Futomaki (large) sushi rolls. 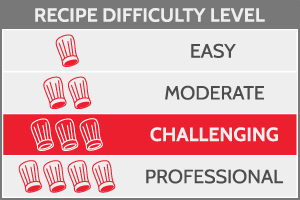 Recipe can be increased or reduced as needed.